Sun starved Brits often sit outside for far too long before realising that their skin is burnt and they’re really dehydrated. There are a few different apps, gadgets and even basic calculations that you can use to tell you whether you’ve had your fair share of Vitamin D for the day, but who wants to be getting out a big sun monitor, constantly checking their phone or doing sums on the beach? Well now researchers at the University of Strathclyde have been working with Swedish-based Intellego Technologies to develop a way of alerting people that they’ve been in the sun too long that requires absolutely no effort and it seems the answer is a range of colourful wristbands. 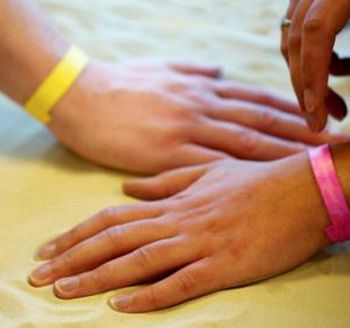 They look like the kind of bands you get when you enter an event or a festival, but the difference is that when they’ve been exposed to a certain amount of UV radiation the chemicals within the bracelet change colour from yellow to pink. Of course wristbands like this have existed before, in fact I remember being given something similar when I was on holiday as a kid, but these latest devices are meant to be much more accurate than anything that’s ever been developed in the past. The main problem with this new wristband concept is they only last one day, which means they’ll need to be super cheap for anyone to purchase them and can’t be used again if you plan on spending all day by the beach.